As some of you will know, I have something of a morbid fascination with disasters, having written my Masters dissertation on poetic responses to mass death. Hence, when a friend of mine mentioned The London Month of the Dead on her Facebook page, my interest was piqued. A few minutes away from West Brompton tube station, this amazing cemetery looked beautiful on the unseasonably warm Autumn day we visited. Our event was held in the Chapel which made for an ideal venue for the lecture we were attending. The space was heated and I've no doubt it would have been comfortable were the weather not so mild. 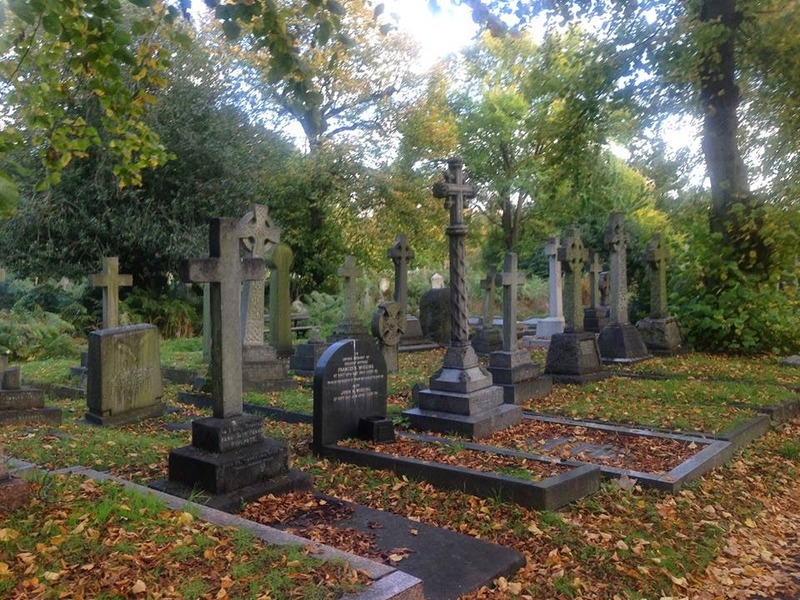 The event runs for just over a month and is part of a fundraising campaign to restore Brompton Cemetery, with 20% of the ticket revenue going directly towards this. Also included in the £12 ticket price was a Hendrick's Gin cocktail (what better way to start a discussion about death and disaster?). This particular event was divided into two halves with Matt Brown from The Londonist starting the talk with research on little known disasters in London's history, whether it was The London Bridge Fire of 1212 or The Regent's Park Ice Skating Disaster of 1867. Brown was an engaging speaker who is clearly very knowledgeable on his subject. What I found particularly fascinating was discussion around more recent disasters which seem to have been all but wiped from the collective consciousness. It seems that where marginalised groups in society are involved, these disasters do not garner the same attention as other tragedies. For those of you interested in London's disasters, Brown has put together an interesting map which can be found here. Part two of the event featured Matthew Hogan from the London Resilience Team, the sector of the Greater London Authority dedicated to ensuring the capital is well prepared in the case of a disaster. He discussed the measures London has in place should an unexpected disaster befall the city, from dealing with the bereaved to setting up emergency mortuaries to deal with the extra corpses. He spoke a bit about the 7/7 bombings and how the plan was put into action on that occasion. I tend not to consider those behind the scenes during a large scale disaster, though I actually left feeling quite reassured that there is an entire team dedicated to planning for these horrific events. All in all, it made for an interesting event and a rather unique excursion. Some may think it all sounds rather morbid, but I actually think it's healthy to have events which discuss death and disaster openly.